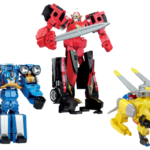 Even More Hasbro ToyFair Images- Beast Morphers & PlaySkool Heroes! 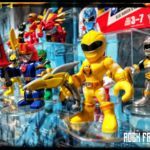 The setup for Toyfair 2019 continues, with a new handful of images from Hasbro highlighting the great new changes to the Power Rangers franchise! Taking center stage this time is a new series from PlaySkool known as the PlaySkool Heroes Power Rangers subline! This collection offers a series of blind-bagged Power Rangers figures, featuring a wide variety of characters. In addition, the Heroes line will contain a wide variety of Morphin Zord playsets- current display includes Zords from Power Rangers Wild Force and Power Rangers Dino Thunder. Not to be outdone, several new images from the Power Rangers Beast Morphers shelves have been released- giving us our best look yet at the new Rangers, Beast Bots and sinister villains. ToyFair officially opens TOMORROW– February 16 2019– and Tokunation will be on-hand to bring you all the remarkable details! Join in our Ongoing Toyfair Discussion Thread to share your thoughts & fears on the future of Power Rangers! First Look at Hasbro’s Beast Morpher Zords and Playskool Red Dragon Thunder Zord! In case you missed it, we got our first look at Hasbro’s Beast-X Ultrazord earlier last week along with the Beast-X Megazord formations. Thanks to an exclusive from Gizmodo.com. Not to be outdone, but we now have photos of the individual Zord modes too. Hasbro released new photos of the triple changing Beast Racer Zord in bot, cheetah, and car modes along with the dual changing Beast Wheeler Zord in gorilla and truck modes arriving later in the fall. The triple changing Beast Racer Zord will set you back $30 dollars, while each of the dual changing Zord running 25 a piece, the Zords are expected to hit store shelves sometime in the fall. In addition, a new offering from Playskool was revealed to be the Red Dragon Thunder Zord from season 2 of Mighty Morphin Power Rangers. Playskool’s Red Dragon Thunder Zord comes in at an impressive 14 inches tall and will come with a Dragon Shield Red Ranger figure and will also run for $30. 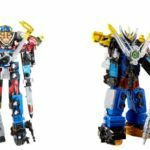 Power Rangers Beast Morphers Beast-X Ultrazord & Playskool Wild Force Morphin Megazord Revealed! Two more images from the first Hasbro produced Power Rangers toyline have been released! *First up is the Power Rangers Beast Morphers Beast-X Ultrazord! This is a non-combining version of the ultimate Beast Morphers combination, featuring lights and sounds. The suggested retail price for Beast-X Ultrazord is $39.99 USD. *Next up is an item from the Hasbro subsidiary PlaySkool! For the even-younger fans, we have the Morphin Megazord Playset! Based on the Wild Force Megazord from Power Rangers Wild Force this Megazord converts from Robot to Beast in a single step! Suggested retail price for the Wild Force Morphin Megazord is $59.99 USD. Both figures are currently scheduled for release in Fall 2019! Stay tuned to TokuNation for all Hasbro Power Rangers reveals!